In 2018, Moscow plans to open the world's largest indoor theme park, Dream Island. The park will feature both animated characters from both Russian and international films. Generations of Russians have dreamed of having a Disneyland of their own, and now that dream is – almost – about to come true, with the construction of Dream Island, a theme park similar in scope and design to the famous American attraction. While the city’s ex-mayor Yury Luzhkov promised to build one in the capital but failed to find investors, the current mayor, Sergei Sobyanin, was lucky – he has managed to attract Regions Group, one of Russia’s largest real estate developers, which plans to invest at least $1.5 billion of its own and borrowed funds in the project. According to official announcements, the park, to be built on an allocated site of about 100 hectares in the Nagatinskaya floodplain to the south of Moscow, will open its gates as early as 2018. Preparatory work is already underway and construction is due to begin in March. The main obstacle to building a licensed theme park was the climate: In Moscow, the functioning of an outdoor park is only possible four months of the year. Therefore, the authorities have chosen to construct an indoor park (a single 35-meter-tall building), which can welcome visitors all year round. It is expected that the park will be visited by four to six million people annually. While the authorities and investors anticipate that the vast majority of visitors will be Russians, they hope that the park will also entice foreign tourists, who typically spend no more than three or four days in Moscow, to stay in the capital longer. 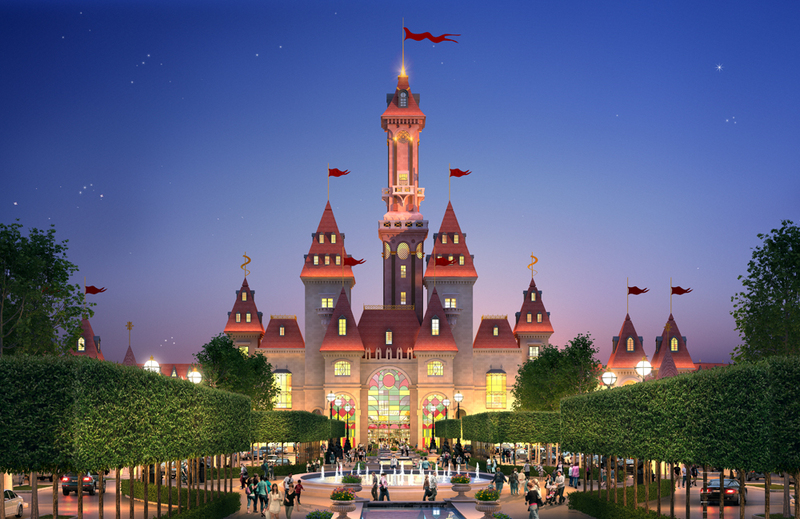 The visual solution of Dream Island is reminiscent of Disneyland's Cinderella Castle, but the authors of the project insist that it is not a stylization, but a completely original design. The architectural concept of the park was developed by the British company Chapman Taylor, while the Italian company Land Milano was in charge of landscape design. "All castles have similarities, so such comparisons cannot be avoided," said Amiran Mutsoyev, a member of Regions Group’s board of directors. "The principal difference is that Disneyland is aimed at children, while the Island is designed for visitors of all ages. Our park will focus on the characters from Russian fairy tales and cartoons, for example – Cheburashka and Gena the Crocodile." More than 60 percent of the space of the park will be allocated to Russian cartoon characters, and the rest to international characters – the company has signed licensing agreements with three major studios, including DreamWorks Animation, on the use of their cartoon characters. The thematic areas will feature not only the characters, but also the scenery of famous cartoons. For example, a mild rainforest climate will be recreated in the dinosaur zone, while the Snow Queen area will have the winter sky and snow. In addition to thematic pavilions, the park will have about 40 rides, including a roller coaster with a vertical loop. The park will also have a sailing school, concert hall and a three-star, 410-room Accor hotel as well as shops and restaurants.